The Baltimore Stars, reigning champions of the United States Football League, were struggling at 5-6-1 as they faced the Orlando Renegades on May 17, 1985. Highly successful as a Philadelphia-based franchise in 1983 and ’84, the Stars were having difficulty adjusting to the move to Byrd Stadium at the University of Maryland (Baltimore’s Memorial Stadium was unavailable) while continuing to practice in Philadelphia. However, Head Coach Jim Mora’s team still had a solid defense plus an effective ball-control offense directed by QB Chuck Fusina that featured RB Kelvin Bryant. The Renegades, coached by Lee Corso, were the remnant of the far-less-successful Washington Federals of the prior two years. They came into the contest at 3-9, but were showing improvement after getting off to a 0-6 start. Highly mobile QB Reggie Collier led the attack but the defense was poor, often failing in the second half of games. There were 23,121 fans in attendance on a Friday night at Orlando Stadium. The Renegades took a 14-0 lead in the first quarter, first on a six-yard TD pass from Reggie Collier to WR Jackie Flowers less than two minutes into the contest that was set up when Baltimore’s Kelvin Bryant fumbled the ball away at his own 11 yard line, safety Victor Jackson recovering, and then on a four-yard run by RB Leon Perry that completed a six-play, 50-yard possession. Jeff Brockhaus added the extra point after each. The Stars came back in the second quarter when Chuck Fusina threw long to Bryant for a 43-yard touchdown and David Trout added the point after. However, Perry scored a second touchdown shortly thereafter, carrying from two yards out. Trout kicked a 42-yard field goal for the visitors in the final minute, but the Renegades held a surprising 21-10 lead at the half. The Stars were known for their opportunism on defense, and two big plays by inside LB Sam Mills in the first four minutes of the second half turned the game around. First, he returned an intercepted pass 20 yards for a touchdown. Then he forced a fumble with a hard tackle of RB Henry Odom, who had just caught a Collier pass across the middle, which gave the Stars the ball at the Orlando 22 when DE William Fuller recovered. Six plays later, Bryant ran five yards for another Baltimore TD. The Stars were suddenly in front by 24-21. The Renegades came back strong on offense, driving to the Baltimore one on their next series. However, the Stars repelled three straight runs and it was Mills making a big stop of Odom inches from the goal line on fourth down that ended the threat. The Stars responded with an 83-yard drive and Trout added a 34-yard field goal before the period was over. There was one more score midway through the fourth quarter as Fusina passed to WR Herbert Harris for a 16-yard TD, icing the cake for the Stars. Baltimore came away with a comfortable 34-21 win thanks to 24 unanswered second half points. Orlando outgained the Stars (348 yards to 301) and had more first downs (24 to 19). However, the Renegades also turned the ball over five times, four on fumbles, while the visitors did so twice. The Stars also recorded five sacks, to three for the home team. There were many penalties, with Philadelphia flagged 15 times to 9 called on Orlando. Chuck Fusina completed 15 of 30 passes for 204 yards and two touchdowns while giving up one interception. Kelvin Bryant ran for 87 yards on 16 carries and also led the club with 5 pass receptions for 74 yards, scoring one TD apiece on the ground and through the air. For the Renegades, Reggie Collier was successful on 27 of 47 throws for 243 yards and a TD with one picked off. Collier was also Orlando’s rushing leader as he accumulated 50 yards on five attempts. Jackie Flowers caught 7 passes for 93 yards and a score. The win evened the Stars’ record at 6-6-1 and they went on to win four of their next five games to finish fourth in the Eastern Conference with a 10-7-1 tally. The rally continued into the postseason as they went on to defeat the Oakland Invaders and repeat as USFL Champions. Orlando ended up at 5-13 and the bottom of the conference. 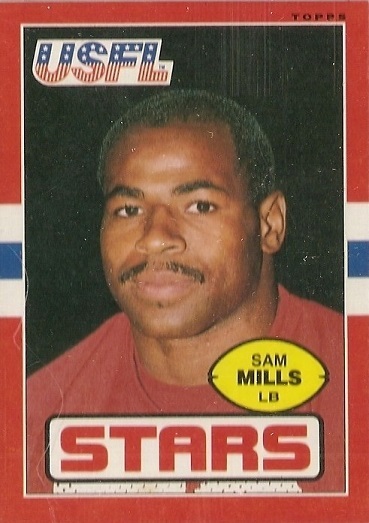 Sam Mills was a consensus first-team All-USFL selection for the third straight year. An undersized (5’9”, 225 pounds) player out of Montclair State in New Jersey who had previously failed in free agent tryouts with the NFL Browns and CFL Argonauts, he made the most of his opportunity in the Spring league and, following the demise of the USFL, moved on to the New Orleans Saints of the NFL along with Coach Mora. He was selected to four Pro Bowls as a member of the Saints and one after moving on to the Carolina Panthers.